On April 12, 1861, the day secessionists in South Carolina bombarded Ft. Sumter to fire the shots that opened the American Civil War, then-Colonel Robert E. Lee was perhaps America’s most accomplished soldier. Lee had served with distinction in the Mexican War, leading a reconnaissance patrol that discovered the means by which the Americans defeated the Mexicans at the battle of Cerro Gordo. He had served as Superintendent of West Point, had supervised the construction of numerous coastal fortifications, and most recently, Lee commanded the forces that captured abolitionist John Brown and the gang that had attempted to seize the government arsenal at Harpers Ferry, Virginia and start a slave rebellion. As America moved inexorably toward Civil War, General Winfield Scott, the highest ranking American general, and a hero of the Mexican War, told President Abraham Lincoln that he wished Lee to command the Union army. Lee, who on March 28, 1861, had ignored an offer of command in the Confederate army was offered the command on April 18, 1861, just six days after Ft. Sumter. Lee refused the command on the grounds that he was a Virginian and owed his first allegiance to the state he believed was a sovereign entity with the right to stay in or leave the Union as it saw fit. He would, he said, not make war on the Union, but he would defend the state of his birth. Why would Lee choose the state of Virginia over the United States of America? Lee wasn't pro-slavery, he believed, as did many others of his day, that the United States of America was merely an association of sovereign states that could, if they chose, leave it or dissolve it. That this view had been forcefully rejected by his fellow Southerner President Andrew Jackson who wrote in a proclamation rebutting an earlier move by South Carolina to nullify federal law, “I consider, then, the power to annul a law of the United States, assumed by one State, incompatible with the existence of the Union, contradicted expressly by the letter of the Constitution, unauthorized by its spirit, inconsistent with every principle on which It was founded, and destructive of the great object for which it was formed,” did not back in 1861 make it any less persuasive to many in the South and even some in the North. We all know of Lee’s legendary conduct of the Civil War campaigns in defense of Virginia, his defeat at Gettysburg and his eventual surrender to General Ulysses S. Grant at Appomattox Court House, Virginia. 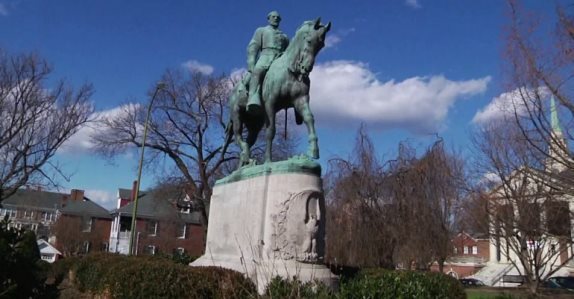 Were Lee’s erroneous view of the Union and the Constitution and his conduct of the Confederate armies during the Civil War all we knew about Robert E. Lee there would be little controversy in removing his statues from their places of honor. But it isn’t what Lee did before and during the Civil War that makes him such an important figure in American history – and one that should be honored – it is what he did after the Civil War that earned him the memorials erected to his memory and a place in history that should be honored by all. When Lee surrendered at Appomattox he also signed a parole document swearing upon his honor not to bear arms against the United States or to “tender aid to its enemies.” Lee’s surrender and his immediate parole were essential in preventing the Civil War from continuing as a destructive guerilla war that would have continued to rend the country indefinitely. General Grant’s terms provided that all officers and men were to be pardoned, and they would be sent home with their private property - most important, the horses, which could be used for a late spring planting. Officers would keep their side arms, and Lee’s starving men would be given Union rations. Just six weeks after Lee’s surrender at Appomattox President Andrew Johnson issued a Proclamation of Amnesty and Pardon to persons who had participated in the rebellion against the United States. However, there were certain excepted classes and members of those classes had to make special application to the President. Robert E. Lee was among those excepted, and there were plenty of people in the North, including members of Congress, who wanted to see him tried and executed for treason. However, there was one man who refused to countenance such a course of action; General Ulysses S. Grant. Grant rightly understood that fulfilling the terms of his parole of Robert E. Lee were essential to healing the wounds of the Civil War. On October 2, 1865, the same day that Lee was inaugurated as president of Washington College in Lexington, Virginia, he signed his Amnesty Oath, thereby complying fully with the provision of Johnson's proclamation. Lee's greatest legacy is not his campaigns, which are still taught at military institutions around the world, but his contribution to national reconciliation. Although he had ostensibly retired from the national spotlight, Lee became a voice of moderation and patient compliance. In his public letters, a number of which were reprinted in newspapers, he urged that "all should unite in honest efforts to obliterate the effects of war and to restore the blessings of peace." Lee vowed to do "all in my power to encourage our people to set manfully to work to restore the country, to rebuild their homes and churches, to educate their children, and to remain with their states, their friends and countrymen." Lee's code of conduct demanded submission to federal authority. With characteristic self-discipline, he put the past behind him and moved forward. Many southerners proved willing to follow Lee's example and through them the United States was not only reunited, but rebuilt into the preeminent military and economic power it is today. Erasing Robert E. Lee from history – or celebrating him as a symbol of “white nationalism” – is a grave error; not only does it distort history to suit the purposes of elements in society that Lee abhorred, it misuses one of the greatest symbols of the social compact that reunited the country after four years of brother against brother bloodshed and hatred. George Rasley, Editor of ConservativeHQ.com served on the Indiana – Tennessee Civil War Commission. His ancestor Rep. Joseph H. DeFreese sponsored the post-Civil War legislation to readmit Tennessee to the Union and many in his family fought with distinction on the Union side in the Civil War. Submitted by email_registrat... on Thu, 08/17/2017 - 23:35. Lincoln was raised in a community of Christians that abhored slavery. Many in south and north did not like slavery and most who had slaves did not abuse slaves. No one abused slaves more than one black plantation owner in the south, I believe in Alabama - forgot his name, who was black. There were free blacks though in some places some would make slaves of them and destroy their documents of freedom. Once the Civil War was over and the new political party set up by Lincoln called the Republican Party succeeded in freeing slaves and even having black stately well educated senators and reps in Congress, a firm step towards equality indeed - it was Democrats that undermined these efforts of freeing the slaves, mostly southern democrats that controlled their areas of their states making it difficult for those who despised slavery and the democratic KKK to speak up against the wrongs. In some southern states, especially Alabama such control of blacks and whites that resisted slavery and wrongs to blacks, many were intimidated and enslaved in ways black and white. Though Lincoln never had a slave, the northern General Grant, who later became a president, did have slaves. Hey, slavery would not have ended up north if the harvest seasons and times of productivity by slaves vs costs of housing, caring for, clothing, and feeding slaves had been more profitable. THIS IS A FACT! Anyone who, except for servitude to pay off a debt owed them, enslaved another person had no Biblical grounds to own anyone. Think you are not a slave in servitude??? Go get a loan you can not pay buddy. They may not beat you but can put you in jail and take away all you own. Teaching people to be dependent upon big government rather than giving jobs was mostly orchestrated by the new form of slavery issued first by democrats called 'entitlements' of 'welfare'. It is one thing to help a person help themselves and quite another to make them dependent upon you. Lee only got involved in the Civil War because his state he defended and loved seceded from the union. Good grief when Trump won California wante to secede from the union and others have threatened, especially socialist leftists. The south even without slavery issue had reasons to secede from the union. They were looked at as dumb and ignorant - nothing could be further from truth about farmers and people down south who worked until they went to bed, got up early. Sure they did not read books like the north that was focused on companies and industry that had plenty of time to read during the cold months they faced. I am not excusing north or south. We have those who work hard today and have little time to study and read to make a living while others who are much better off and have a lot of lax time. My grandfather was a farmer but BRILLIANT. He did take time to read in the evening before having a long hard day of work. He forged his own steel, made his own tools, built a huge barn and home that was second to none, handled cattle, pigs, hens, and horses while farming a huge acreage of his land. He had willing slaves - sharecroppers who for room and board and food helped him willingly handle the farm tasks. He was smart enough that when a doctor misdiagnosed his wife's ailments that he corrected the doctor in medical terms. Sure he may not have been the typical farmer especially in former civil war times but don't underestimate what it takes to be a successful farmer let alone SURVIVE in those times. Fortunately, unlike these days, people helped their neighbors out of Christian charity. Yes some people then as now were despicable like General Albert Pike who served Lucifer as a true southern rebel against God and humanity. Never forget that people like Sherman went on rampages killing and destroying animals and farms and crops to kill off the southerners. Evil is evil north or south buddy. Mercy, mercy. Are these people losers or what? Submitted by Ckm4cuqB2q on Tue, 08/15/2017 - 20:05. The level of ignorance, although understandable considering 40 years of leftwing on purpose perversion in education, is astounding. These people are intellectually hopeless. They are bankrupt of thought processes. Or worse! Submitted by email_registrat... on Mon, 08/14/2017 - 22:29. Agree with you sir. Except I heard that Lee worked to free his inherited slaves before the Emancipation. Perhaps I am mistaken? Grant's words make sense and yet I wonder why he put up with the Union League's destructive and oppressive practices diuring Deconstruction under his presidency. All of this is good to discuss and learn from but we are preaching to the choir here. The ones who need to learn this are the progressives who refuse. Liberty is not a part of the NWO. WE NEED TO EDUCATE OUR OWN AND OTHERS WHO WOULD LEARN ABOUT THE ORIGINAL CONSTITUTION AND THE framer's intent and to develop a nullification mins set. Trump only has 3.5 more years. Submitted by vsteele on Mon, 08/14/2017 - 13:39. Protesters against Confederate Robert E. Lee were right to remove his Statute which is a symbol of hatred and racism. Robert E. Lee was a slave holder and John Brown a slave abolitionist was the real hero who fought to end slavery especially among blacks. Robert E. Lee statute should be removed because it opens the terrible wounds of slavery and the nightmare blacks faced in the South from Confederate soldiers. Submitted by jml2621 on Mon, 08/14/2017 - 11:38. Any statue removed from a public square should be moved to a confederate museum. His actions and views on slavery were complicated. Lee held his wife's slaves on their plantation until her uncle's will requested their release. He repudiated slavery in an 1856 letter to his wife, while allowing the NV army to capture freed slaves in PA. He initially opposed succession while defending his home state of Virginia. A fair and balanced look at Robert E. Lee should be kept in museums and other repositories of history. Submitted by mwood33333_1 on Mon, 08/14/2017 - 11:16. Submitted by email_registrat... on Mon, 08/14/2017 - 11:00. .1 For over 100 years up to covert jihadist Obama’s era, I never heard a complaint about any civil war monument. .2 I am convinced an investigation would prove the initial complaints, its publicizing (advertising), the core planning and organizing of these protests (both sides) were funded by groups affiliated with Obama (a Soros puppet) and the anti-American Establishment. .3 This effort is to destabilize our country’s patriotism and progress made in social and racial integration. .4 These protests would stop quickly if legislation were passed to hold any person, group or entity affiliated with funds or training in any part of such a gathering or protest must be: personally, and individually liable and responsible for all costs, damages, arrests, injuries … and deaths. .5 I am positive that this is a well funded effort by the NWO derivative Establishment, Soros and his paid minions and he should be constrained by courts if not arrested.